It is hard for me to accept that I went three weeks with this in theaters and I'd not seen it yet. Holy crap, is this a great movie! 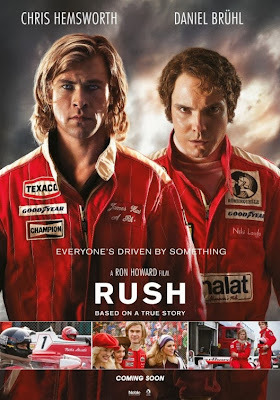 I know nothing about Formula 1 racing, I knew next to nothing about this story and I've been hit ot miss on Ron Howard films for years. So you can take my word to the bank, this is one of the best films of the year. If it gets lost among all the other great films coming out now because Americans are not well versed in Formula 1, it would be a crying shame. The screenplay and performances in this movie are sure contenders for awards consideration and the film is directed with great confidence and patience by Mr. Howard. This is a thinking person's movie. It asks big questions and it probes deeply into the psyche of competition. James Hunt and Niki Lauda are legends in their field. While they might be embraced by fans of racing, as portrayed here they would not be embraced by most of humanity. Each one has damning flaws and personalities that would drive the average person to the brink. Hunt is a reckless glory seeking thrill addict, who can't make an emotional connection and leaves a series of romantic conquests in his wake. Lauda is a brilliant machine, focused on the odds and playing a strictly regulated percentage as a competitor. That he manages to form a fully functioning romantic relationship is miraculous in itself since his arrogant self assurance is so off putting. As each one circles around the other, it is clear that their rivalry is uniquely reponsible for their individual success. Americans know how Larry Bird and Magic Johnson drove each other further along the path of greatness, this relationship works the same way. Each one needs the other as a standard by which to be compared. Both actors are terrific in the parts they are cast in. Chris Helmsworth was made to be an object of romantic fantasy. Women will want him and men will want to be him. He has swagger and weakness at the same time. he knows he can count on his good looks and his driving skills, but he can't always count on his head to tell him the right thing to do. The scene where Hunt antagonizes his wife into the arms of Richard Burton happens quickly and Helmsworth plays it fast and dismissive. Later he is all manufactured confidence when he announces to the world that he and his model wife are calling it quits. His crack to the media sounds light and cynical but we get a peek behind the curtain and see how it really effects him. Daniel Brühl as Lauda has the showier role despite being a character that is more contained. The physical transformation after his accident and the internalized struggle he goes through in trying to find enough reason to marry is played very well on screen. The car racing sequences are aggressively edited and the sound design was impressive. I felt frequently caught up in the recreation of races from nearly forty years ago. The dramatic crash that briefly sidelines Lauda but changes him almost not at all was frightening and a little stomach churning as well. The harrowing hospital scenes are another place where Brühl gets to be the center of the story and show us what he has got. Hans Zimmer may have some cliches in his bag of tricks, but they work really well in this movie and the musical score keeps us involved and on the edge of the seat during the races. Howard and his team of editors don't linger over scenes and they don't cut them so quickly that you can't tell what is happening. This film was put together by people who know how to tell a story.